I am so not a morning person and had to drag myself out of bed early just to visit Takayama’s Morning Market (Asaichi – 朝市)! There are actually two morning markets in Takayama – the Jinya-mae Market 「陣屋朝市」 in front of the Takayama Jinya and the Miyagawa Market 「宮川朝市」 along the Miyagawa River. The markets operate between 6am-12pm from April to October and 7am-12pm from November to March. Fresh produce, plants, pickled goods and even handicrafts are sold at the markets. Some stalls also sell Sarubobo「さるぼぼ」, a popular good luck charm in the Hida region. To-date I’ve visited the Jinya-mae market 「陣屋朝市」 twice, as I had taken a package tour on both occasions (the first time in 2009) and the tour leader had brought us there. This particular market seems to be popular with tour groups (probably because there is coach parking available nearby)! Chillies were being sold as a decorative item and not as a cooking ingredient! Walked by this stall selling apples and the lady sliced some for us to sample – they were crunchy, juicy and sweet! Thus, I bought one for ¥100 in case I needed a snack for later. It was probably the best-tasting apple I’ve eaten to-date! On both tours which I had been on, we only had one morning in Takayama and thus didn’t go to the Miyagawa Market 「宮川朝市」, but here’s a picture (which I took on my last trip) of its location, when I arrived at the town on the previous afternoon. I must say that the Miyagawa river is quite picturesque and you can find various birdlife and fish in it. The water is really clear and looks refreshing. 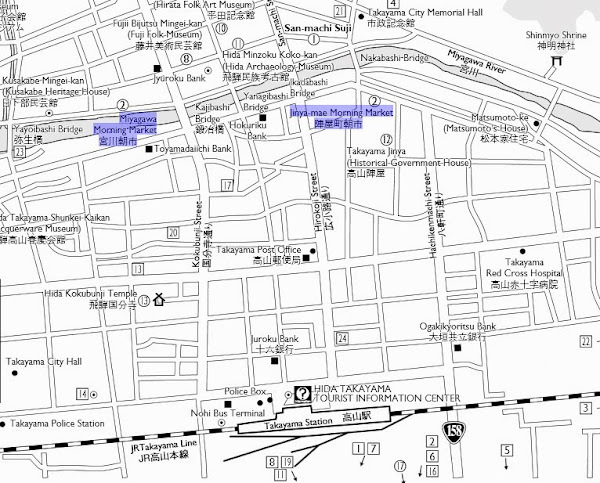 Both the Takayama Morning Markets are a 5 to 10 minute walk from the JR Takayama Station on the JR Takayama Line.